Post Super Tuesday: Obama and Clinton; Who's Winning Online Now? Who actually won Super Tuesday? In the world of primaries, the news is mixed with both Barack Obama and Hillary Clinton claiming victory. In the online world, however, certain issues have become clearer. So what's changed since our last post? In our previous post, "Who's Winning the Elections on Web 2.0," we pointed out that candidates like Hilary Clinton were not buying paid search terms - even on their own name. Since our post a week ago, it looks like all of the major presidential candidates have started some form of search engine marketing campaign. Latecomers like Clinton and Mitt Romney have joined Google advertising incumbents like Obama and John McCain. 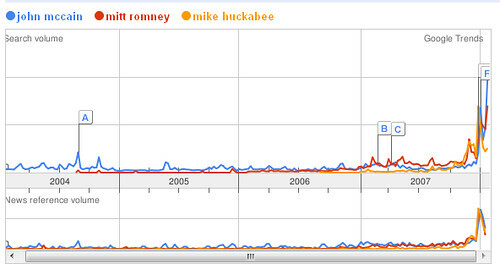 However, Romney's Google AdWords campaign did not last long. Romney has since pulled his campaign after announcing his withdrawal today. 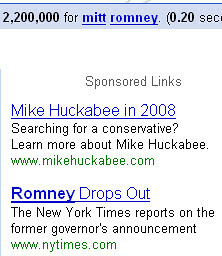 Instead, Mike Huckabee has stepped in by advertising on the keyword "mitt romney". This was a tactic we also "recommended" in our last post. In the area of voter interest, some things have changed, but much has stayed the same. Among the Democrats, Obama (blue line) still leads Clinton (red line in the number of searches conducted on Google by a wide margin. 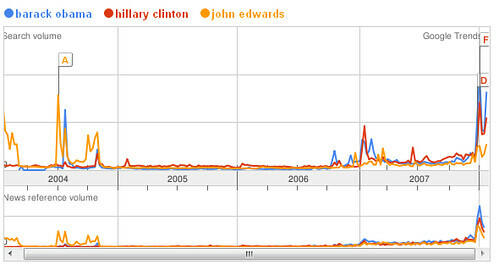 John Edwards (since withdrawn from the race), of course, still lags. The biggest shift is in voter interest in the Republican candidates. McCain has made a comeback in the wake of Romney's withdrawal. As far as website popularity is concerned, not much has changed. Obama and Clinton's websites still outpace McCain and Romney's. JohnEdwards.com has naturally since declined precipitously. One interesting detail to note is that BarackObama.com's popularity (blue line) has become exponential with a huge spike in traffic in recent days. Although still outshining Clinton in the area of search engine optimization and leverage of user-generated content, BarackObama.com's pages indexed has declined to 458,000 from 502,000. By contrast, HillaryClinton.com's page count has increased from 42,400 to 46,100. Still weak, the Republican candidates' websites haven't closed the gap yet with their Democratic opponents with less than 10,000 pages indexed each. It doesn't look like they're capable of leveraging Web 2.0 marketing strategies to galvanize their online campaigns. Oftentimes, leaders in technology develop such an insurmountable lead that it's almost impossible for competitors to catch up. The massive popularity of Barack Obama's social network falls into this category. Networks become more and more useful as the number of users increases so they build up increasing amounts of momentum. We can see glimmers of this in the persistence and, especially, increase of BarackObama.com's traffic as well as general voter interest in the candidate himself. Whether the Internet is the new television is still up-in-the-air, but we can already see that it may act as an indirect and possibly leading indicator of nascent trends.